Our popular School Take Home Folders are our answer to excellent organization and communication for your kids. Also included is a check off worksheet to mark homework assignments finished. 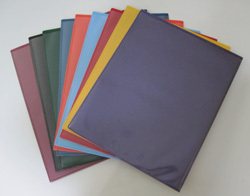 School Take Home Folders are made of durable, water resistant polypropylene and sealed with ultra sonic sound for a strong, long lasting bond. Our School Take Home Folders are the perfect take home communication tool for your kids and students. Free shipping to all schools in the continental USA. Our School Take Home Folders can be stamped in English or Spanish on the front cover. You can uniquely identify your folder with a 4" x 6" stamping of almost anything you want, right on the cover! Great for School Logos, School Mottos, or both! Parents and teachers can write messages and slip them into the pocket, right on the cover! On the inside left pocket, we have stamped "Return to School" (and "Para Devolver A La Escuela" for the Spanish version). This is where students can keep homework or school notes. Acts are the perfect take home communication tool. On the right pocket "Keep at Home" (and "Para Guardar En Casa" for the Spanish version) is stamped. Here students can place work that must be kept home, be it notes or school events Students will know what work stays home and what goes back to school with them. 13 to chose from. Acts as the perfect take home communication tool. For School Take Home Folder Colors, Pricing, and click here.